This panel was developed for as a table-like panel for presenting bar charts, providing some useful additions particularly suited to process control/monitoring dashboards. As such, Multistat displays never use scroll-bars (scroll bars are useless in monitoring dashboard). All this, and optional flashing too when bars surpass these limits. 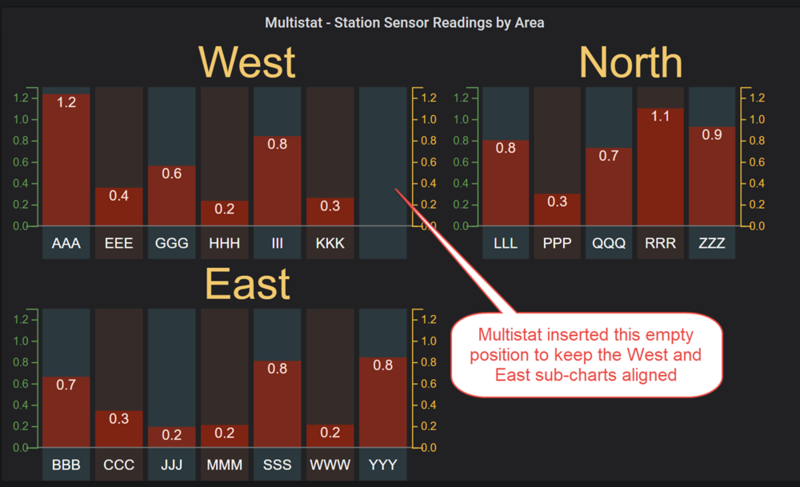 Multistat accepts Grafana table formatted data. There is no support for time series formatted data - at least not in the current version. As a minimum, Multistat requires table data with at least two fields per row - one, a label (string) and the other, a value (numeric). Note though, that these fields can be called anything. Multistat makes no assumptions regarding the names of the table data field it handles. Each distinct label will be displayed as a bar - the length being determined by it's numerical value. A timestamp field can be useful too - this can be in any commonly understood format (Multistat uses the popular Moment.js java script library for manipulating time/date strings - see https://momentjs.com/docs/#/displaying/ for details). A grouping field can be useful too, to organize large data sets into more meaningful sections. When grouping, the number of columns can be pre-configured, along with handy mechanisms for filtering and arranging the order each group is presented in. Duplicate labels in table data. Each distinct label in the input data results in a distinct bar in Multistat. Ideally, table data should be created by queries that return distinct data sets - that is, sets in which each label is presented in a single row. When data sets are processed with multiple rows for a given label, Multistat needs to know which value to use (and hence, which values to ignore). A configurable aggregation parameter tells Multistat how to handle this. 'Last' (and 'First') select the last (or first) row in the data for any given label, throwing out all the others. The optional date/timestamp field helps too by presorting the data table before selecting the aggregation function. The tool-tip then shows the set of fields for the selected data row, as expected. Setting the aggregation parameter to 'Max' or 'Min' works in a similar way, selecting the row for each label with the corresponding value - and secondly using the last or latest value in the event that there is a tie in the value. Setting the aggregation parameter to 'Mean' results in the arithmetic mean of all duplicate values to be used, as should be expected. A side effect of this though is that the fields presented in the tool-tip balloon in this case represent just one of the rows - actually the 'last' row, the value of which will not generally match the displayed 'mean' value for that label. Data set size - a performance consideration As mentioned before, ideally the data set should contain a single row for each distinct label. This offloads the maximum amount of filtering and aggregation etc., to the database which is generally much more efficient for these tasks. In the event that the database cannot pre-filter the data in this way, the aggregation setting can still generate the required display, but at the cost of increased CPU and network load. Generally, this is not significant - Multistat can easily handle queries with a few hundred labels, each with a hundred or more rows. Note though that huge data sets - data sets with multiple megabytes of data etc. - these will negatively impact performance. Particularly as refresh rates shorten. In extreme cases, this can even make the browser become unresponsive. Beware of enormous data sets. Multistat has a wealth of configurable options. just about everything displayed can be adjusted and hidden using the extensive set of configuration options, described in detail below. The Grafana-standard Metrics tab allows the user to specify a query, to be issued each time the panel is refreshed. This area is under continued active development. Currently, Multistat only supports Table data queries. Each row returned will be displayed as a bar, auto-sized to use the available space. The panel does not provide scroll bars, so any query returning more rows than can comfortably fit in the allotted panel area will be unreadable. Multistat queries are expected to be something along the lines of ''Get the working pressure of all steam boilers in building 5'' or ''Get the temperature of the 10 hottest cities in the US'' etc. Anything that can be re-queried efficiently and returns a list of results containing - at minimum - a Label (e.g. Boiler ID or City Name) and a value (e.g. the pressure or temperature). 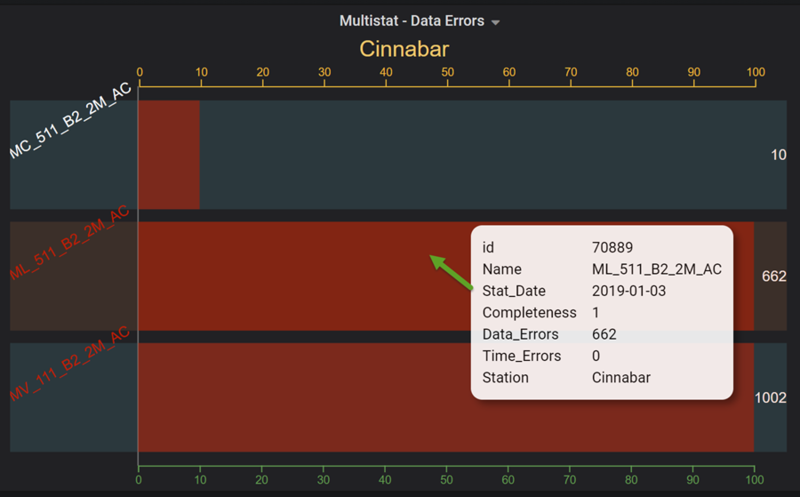 Optionally, Multistat takes advantage of a DateTime field, if present, which can be displayed alongside the panel title as an indicator as to the last time the data was updated. More details on this below. If no query is defined, or the data source is unavailable, Multistat displays a simple "No data" warning message. Multistat can only display a single bar for each label. Ideally, query results should be written to return a single value per label. 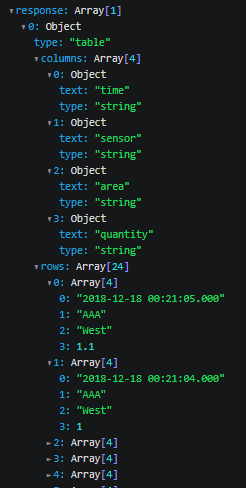 When this is not possible, and the query returns multiple values per label, Multistat uses an aggregation operator to select one of these (first, last, mean, min or max). *one more - all - will eliminate the aggregator altogether, Be careful - This can create confusing displays as multiple values appear overlying the position of such bars. You have been warned. For efficiency though, it is much better to write a query that only returns the required data. Note, sensor AAA in this data set has multiple values, each a few hours apart. All the other sensors have a single row - this will allow the aggregation feature to be demonstrated later in this note. Each row nthis data set includes a date/time, a label and a value, plus a region field (that will be useful in grouping). The field names can be anything; everything is defined in the configuration tabs. Additional fields, if any, will appear in the tool-tip pop-up display, if enabled. 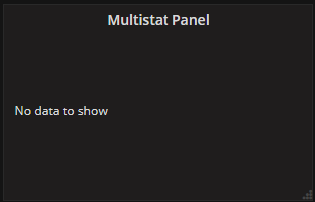 As you can see, Multistat is configured using a number of option tabs. Let's examine each of these in sequence. Here, you can see how the 4 key fields in the query result set get mapped to the Multistat fields. In this case, the label is associated with the query field 'sensor', Value as 'quantity', with 1 decimal place and no scaling (scale factor = 1). Note too that the default aggregation parameter of 'Last' is selected. This dataset contains multiple rows for some labels - this setting automatically selects the last (latest) value for each sensor. Note too, that the bars are set to be sorted in ascending 'sensor' name. The data is set to group on the 'area' field - this will create 3 sub-charts, for the East, North and West areas. The 'Show as-of Date' setting controls whether or not the last update time is to be displayed in the top right of the panel. Most users can ignore this setting. When it is set, the maximum datetime value in the query record set is displayed alongside the panel title. This can be useful in process monitoring applications to provide evidence that the data is being updated in a timely manner etc. The format field controls how this time is displayed (see documentation for moment.js for formatting details), or use the reserved keyword 'ELAPSED' to display as a natural language string, relative to the current time. Help is available, if needed. Label Margin sets the area reserved for the labels can be set according to the length of the labels - or left blank, leaving the panel to calculate a reasonable value based on the actual data, orientation and chosen font size etc. Angle controls the rotation angle for the label text, which can help preserve screen real-estate - particularly when long labels are present. Note - it is quite difficult for the control to predetermine the ideal center of rotation for these labels. Depending on the data, this can make the charts hard to understand. More work in future releases should improve this feature. Still, if it helps in any specific case, feel free to use it. Low Side Margin and High Side Margin set the width of the two axis. Set to 0 to hide one or both of them. The Columns Per Row setting controls how many sub-charts appear in each row. When the data contains more groups than are defined here, additional rows of sub-charts are added, wrapping to fill the available space. Note: If Group Col is set to something inappropriate, such as (say) the value or datetime field, Multistat can generate a ridiculous number of sub-charts - auto-scaled to fit in the available area, resulting in an unreadable mess. Don't panic - just choose a more meaningful grouping field, assuming your data has one. The Group Name Filter field (this is an advanced feature most users can ignore. If in doubt, make sure this is blank. Especially if the chart appears to be empty!). This field should be a regular expression string which is used to filter out non-matching group names, when needed. Using the demo sample data, for example (which contains values for areas East, West and North), we could select just the East and West groups by using a value of 'East|West' (Note the Pipe character '|' separating a sequence of matching strings. Regular expressions are amazingly powerful and can be much, much more complicated than this - but a simple set of pipe-delimited strings is usually enough in this application. The Group Sort Order field is another regular expression string, this time used to define the order the groups are presented in (reading like a book from top left, wrapping to the bottom right). Matched group names are presented in order, followed by any remaining non-matched group names in the default (alphabetical) order. Left blank with our sample data, the groups will be arranged in alphabetical order - that is, East->North->West. Setting this field to the regular expression 'West|North|East' overrides the alphabetical ordering, resulting in a more map-meaningful displays with the West group on the left and the East group on the right (apologies to users in the Southern Hemisphere who might have a different perspective...) Notice how Multistat intelligently adjusts the height and width of the sub-charts to keep all bars the same width, regardless of the number of bars in each group. When more than one row of sub-charts is generated, Multistat inserts blank/dummy rows in groups needed to keep the groups aligned properly. Show Group Labels and Show Labels - as before (Show Group Labels also appeared on the Grouping tab, for convenience).. Set Font Size and color etc. The Out Of Range label color override is an advanced feature for cases where a specific axis Max and/or Min setting is in place (see the Lines-And-Limits tab below) and a bar is outside one of these limits. This color overrides the standard label color for labels where this occurs. (This is useful, for example where a non-working sensor, for example, generates a wildly out of range value) Label Margin, Angle, Low Side Margin and High Side Margin - these too are duplicates of controls on the Layout tab, again, for convenience. Max Value and Min Value These overrides default auto-scaling axis extents, and if the Show Line checkbox is set, control the color of the resulting reference lines. The BaseLine setting (default 0) differentiates between positive and negative values, each potentially having a different color. This can be useful when monitoring deviations from some non-zero set point. For example, Electrical generators (in North America, at least) operate at very close to 60Hz, with normally, only small deviations. Setting a baseline at 60.0 and a Max/Min to (say) 60.10 and 59.90 would make an easily understood display in such an application. Values above the base line are generally draw using the High Bar color (see the Layout Tab). Values below in the Low Bar color. High Limit and Low Limit, if set define additional 'warning' references. Corresponding reference lines and colors are set as before. In addition, the Color Bar option overrides the regular above or below base line bar colors for bars outside these warning levels. Optionally, these can be set to 'flash' - transitioning from one color to another at a controllable rate (period). The period is measured in mS, Values between 200mS and 400mS seem to work best. 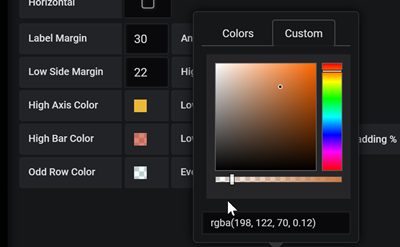 As with all these settings, the user can display a reference line on the chart and set the colors to whatever makes sense in the application. In the frequency example above, there might be high and Low Limits set at (say) 60.05 and 95.95 respectively. Putting it all together, the displays can make a truly unforgettable and un-ignorable, experience. This is a version 1.0.2 release, as such there may be a few known issues that need to be added or fixed. .